Lots of people will be highlighting poetry in April since it is National Poetry Month. Over at Kidlitosphere Central you can read about the ways folks in the kidlitosphere will be celebrating. If you're looking for resources to use in teaching poetry, check out this AMAZING post by Elaine at Wild Rose Reader. Here at The Miss Rumphius Effect I will be highlighting a poem, a theme, a book, or a poet every day and suggesting ways to make poetry a regular part of life in the classroom. I will also be suggesting companion books, web sites and activities to accompany the reading of selected poems. I hope you will join me in exploring poetry for instruction and will consider suggesting your own ideas for sharing poetry with kids. All hail the return of baseball! National Poetry Month begins in just 11 days. As much as I had hoped to continue with interviews this year, life and work haven't afforded me much time for blogging. I do have something planned for April, it's just not as big and grand this year, and will share details in the next few days. In the meantime, here's a little poetry activity that I love. In the past I have mentioned Susan Kapuscinski Gaylord's amazing site Making Books with Children. You can find her this month at Rhythm of the Home where she has posted a fabulous activity to make a PoeTree. Wouldn't this be a great classroom project? I can just imagine a tree where every child has contributed a poem. Okay, that's it for now. Back soon with my April plans. On a recent trip to New Jersey I had to smile when we passed the Joyce Kilmer rest stop. While Trees is much maligned, I've always liked it. In fact, the women in my high school choir sang this poem put to music. As spring is busting out all over here, it's the trees that have captured my attention. They are, quite simply, breathtaking. So, let's write about trees. Leave me a note about your poem and I'll post the results here later this week. Today, March 14th, is Pi Day. No, that's not a typo. It is Pi day, as in 3.14159... you get the idea. The first Pi Day celebration was held at the San Francisco Exploratorium in 1988. What is pi anyway? I'm sure you remember it from math in some formula you memorized, but do you really know what it is? Pi represents the relationship between a circle’s diameter (its width) and its circumference (the distance around the circle). Pi is always the same number, no matter the circle you use to compute it. In school we generally approximate pi to 3.14 in school, but professionals often use more decimal places and extend the number to 3.14159. One activity I loved doing with students was to ask them to bring in a can and lid that would soon be recycled. I always brought in a few extras so that there would be a variety of sizes. Each student was given a lid and directed to measure the diameter and circumference. Students then divided the circumference by the diameter. We recorded the results on the overhead and discussed them. Most were amazed to find that the results were nearly the same, allowing for some margin of error in measurement. This is a quick and fun and provides a meaningful way to introduce the concept of pi. Are you doing anything special for Pi Day? I hope you'll be celebrating in some small way. Perhaps you could make a pi necklace. Since any day is a good day for poetry, you could try reading some pi poems. If you're looking for more ideas, visit the Exploratorium pi site or try this middle school math newsletter. Shortly after last year's earthquake in Haiti I posted a thematic book list on earthquakes. I'm republishing that post here for those of you who may be looking for resources. Also, I recommend Teaching Ideas: The Earthquake and Tsunami in Japan, a resource from the New York Times Learning Network. You'll also find Free Resources to Teach Children About Earthquakes and Tsunamis a helpful link. Given the devastation that follows in the wake of a powerful earthquake, it's hard to see them as constructive, but geologically speaking, that's exactly what they are--constructive forces of nature. Constructive forces (earthquakes, volcanoes, deposition) are forces that build up the earth's surface. Destructive forces (weathering and erosion) are forces that tear it down. The list that follows explains the science behind earthquakes. You'll find some nonfiction titles, some poetry, and a bit of history, both true and imagined. Earthshake: Poems From the Ground Up, written by Lisa Westberg Peters and illustrated by Cathie Felstead - This collection of twenty-two poems introduces geologic concepts through metaphor and word play in a variety of poetic forms. Earthquakes, written by Michael Woods and Mary Woods - Did you know that there is an earthquake somewhere on earth every day? This book in the Disasters Up Close series includes dramatic images and stories of survivors while examining the facts and figures related to some of the world’s biggest earthquake disasters. 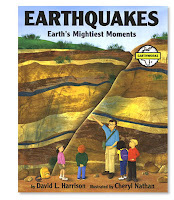 Earthquakes: Earth's Mightiest Moments, written by David Harrison and illustrated by Cheryl Nathan - A good choice for younger readers, this book provides a nice introduction to earthquakes. Readers will learn about the layers of the earth, plate tectonics, the scientists that study earthquakes, and more. Earthquakes, written by Franklyn Branley and illustrated by Megan Lloyd - This book in the Let's-Read-and-Find-Out Science series explains why earthquakes happen, where they occur most often, and what to do if one happens near you. How Mountains Are Made, written by Kathleen Weidner Zoehfeld and illustrated by James Graham Hale - This book in the Let's-Read-and-Find-Out Science series explains the constructive forces behind mountain building. Jump Into Science: Earthquakes, written by Ellen Prager and illustrated by Susan Greenstein - This series from the National Geographic Society explains the causes and effects of earthquakes. Time for Kids: Earthquakes!, written by the Editors of Time for Kids - Using simple language, this book is divided into short chapters and includes the topics of The Earth Rocks, Measuring Movement, Monster Quakes, and Stay Safe. A glossary is included. 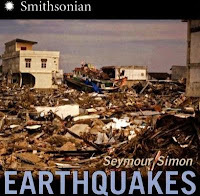 Earthquakes by Seymour Simon - Full color photographs on every page enhance this clear and concise text that introduces the cause of earthquakes and their effects. Historic information on earthquake events is also included. Witness to Disaster: Earthquakes, written by Judy Fradin - This book delves into the science of earthquakes and focuses on the more deadly aspects of earthquake disasters, including building collapse, fire, landslides, avalanches, and tsunamis. Also included is a good deal of information on notable earthquakes in history. The Earth-Shaking Facts About Earthquakes with Max Axiom, written by Katherine Krohn and illustrated by Tod Smith and Al Milgrom - Max Axiom, super-cool scientist and teacher, explains the science behind earthquakes in graphic novel format. Janice VanCleave's Earthquakes: Mind-boggling Experiments You Can Turn Into Science Fair Projects, written by Janice VanCleave and illustrated by Ray Burns - This book contains numerous hands-on activities that will help students better understand earthquakes. The science is good and the explanations are particularly clear and accessible to readers. If You Lived at the Time of the Great San Francisco Earthquake, written by Ellen Devine and illustrated by Pat Grant Porter - This book takes readers to San Francisco before, during and after the 1906 earthquake. The Earth Dragon Awakes: The San Francisco Earthquake of 1906, written by Laurence Yep - Told in the alternating voices of two young boys, Yep tells a gripping story about the events surrounding the San Francisco earthquake. Also included are real-life anecdotes and information about earthquakes. Earthquake in the Early Morning (Magic Tree House #24), written by Mary Pope Osbourne and illustrated by Sal Murdocca - Annie and Jack find themselves in San Francisco shortly before the 1906 earthquake strikes. Earthquake, written by Milly Lee and illustrated by Yangsook Choi - Milly Lee based this story of a child and her family on the memories of her mother, who was eight years old when the 1906 earthquake devastated San Francisco. When the earthquake hits the family must leave their home in Chinatown and make their way to the safety of Golden Gate Park. Includes an author's note that provides more details about the earthquake and describes what happened to Lee's family. If you are interested in additional titles about the San Francisco earthquake of 1906, see the annotated list put together at Through The Looking Glass. In addition to the titles listed above, here are a number of useful sites and resources for teachers and kids. For basic background information, the USGS has a page on The Science of Earthquakes. The USGS also has a comprehensive site for kids called Earthquakes for Kids. Time for Kids has a number of pdf reproducibles, including My Earthquake Fact Book, What Causes an Earthquake?, Earth on the Move (gr. 3-4), I Felt the Earth Move (gr. 5-6), A Whole Lot of Shaking Going On, The Earth's Plates, Forces of Nature (gr. 3-4), and Nature's Fury (gr. 5-6). The FEMA for Kids site has a section on earthquakes. Windows to the Universe has information on Earth's surface and interior at three different instructional levels. The PBS site Savage Earth has an animation of an earthquake in action. Additional background information is available at Savage Earth - The Restless Planet: Earthquakes. The Exploratorium online exhibit Faultline has a section on Quake Basics. The Annenberg Foundation has an online interactive on the Dynamic Earth. TheTech museum has an online exhibit about earthquakes. If you need information on tsunamis, here are some places to start. The FEMA for Kids site has a section on tsunamis. Time for Kids has a pdf reproducible entitled Tsunami Science. The International Tsunami Information Centre has an extensive K-6 curriculum guide on tsunamis. The Pacific Tsunami Museum has a Student Guide to Tsunami Information. The West Coast/Alaska Warning Center has a pdf coloring book for young kids. The PBS site Savage Earth has an animation of a tsunami attack. The USGS has some information on the life of a tsunami. If I've missed a useful title or web site, please let me know and I will add it to the list.